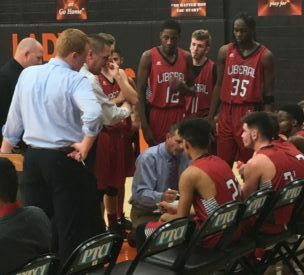 Liberal trailed 25-24 at halftime but rallied to defeat the Guymon Tigers 57-40 in front of a raucous crowd in Guymon Tuesday night. After seven straight games in Guymon being decided by single digits between the Tigers and Skins, Liberal wins handily. It was a tight first half as the Redskins led 9-8 after one quarter. The Tigers took a 25-21 lead and led 25-24 at the half. Cade Hinkle buried three third quarter three’s to help lead Liberal to a 41-31 lead after three. Guymon missed a lot of shots close to the basket in the second half and went just 8-16 at the foul line while LHS was 12-15 at the line. Hinkle led LHS with 20 while Kylan Thomas scored 13 and Cole Evans had 11. Liberal is 2-0 for the first time since the 2010-11 season. They defeat Guymon for a fifth consecutive time. Liberal hosts Hereford at about 7:45 Thursday on 1270 and kscbnews.net as part of the Conestoga/Community Bank Classic.